Tight tolerance molding from Viking Plastics accurately and reliably produces the part tolerance your project requires. 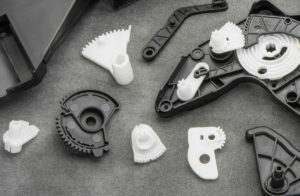 In the world of plastic injection molding, tolerance is a key element in ensuring that all the parts of a product will work together properly. Our ability to combine numerous factors and yield a very tight tolerance enables your engineers to be certain the part will fit with other parts and function as intended. Tolerance is a number that indicates how far a finished part can acceptably deviate from a required measurement. For instance, if a part needs to be 2” wide with a tolerance of +/- 0.01”, then finished parts must be between 1.99” and 2.01”. Anything outside that range is unacceptable. The challenge is to design an injection molding process that can reliably and repeatedly produce parts that fall capably within the range. Machinery: When precision is required, the machinery used must be in optimal working order and carefully calibrated. Processes: Scientific and well-controlled molding processes, including advanced RJG Technology and matching pressure curves, help create the best results. Mold Design: Molds should be designed to yield the greatest consistency of part dimensions. Factors such as cooling rates and number of cavities in the mold affect tolerance. Part Design: Overall size, part geometry, and wall thickness all impact tolerance. For example, thicker walls create more variable shrink rates. The smaller the part, the easier it is to hit tight tolerances. Material Selection: Different materials have different shrink and warp rates, and material with lower shrinkage will yield higher consistency. Why is Tight Tolerance Molding Important? At Viking Plastics, we offer class-leading tolerances on parts because we understand how all the elements of molding a good part need to come together. We invest in new and world-class technology and have machinery that is well maintained and calibrated. We work with tool suppliers who can build top-quality molds. And we can add secondary operations (machine certain features post molding) if necessary to achieve the tightest tolerances. Click below for more information about tight tolerance molding from Viking Plastics.